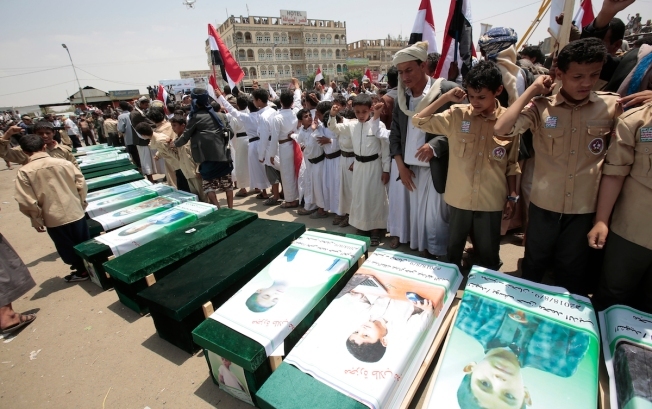 Yemeni people attend the funeral of victims of a Saudi-led airstrike, in Saada, Yemen, Monday, Aug. 13, 2018. Airstrikes by Saudi Arabia and its allies in Yemen are on a pace to kill more civilians than last year, according to a database tracking violence in the country, despite the United States' repeated claims that the coalition is taking precautions to prevent such bloodshed. Bloodshed has surged from fierce fighting at the Red Sea port city of Hodeida, which coalition forces have been trying to retake from the Houthis since June. Civilians have been killed in airstrikes as well as by Houthi shelling and landmines.